A 19-year-old woman, jointly accused with her boyfriend of running a “bomb factory” for dissident republicans, has denied eight offences relating to explosives and ammunition. With a huge prison officer flanking her in the dock at Newry Crown Court, slightly built Orla O’Hanlon entered not guilty pleas to various charges accusing her of making explosives, possessing explosive substances and reloaded ammunition with intent to endanger life and under suspicious circumstances on a date unknown between November 22 and December 18 2013. Alongside her in the dock was her boyfriend 20-year-old Keith McConnan who faces the same charges. His scheduled arraignment was adjourned to Thursday due to a mix-up with his legal team who did not attend on Tuesday. 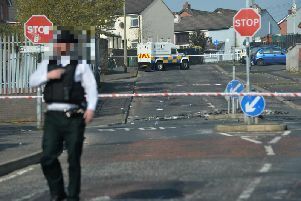 The charges arise after police searched their former home address at the Tievecrom Road in Forkhill, uncovering improvised fertiliser-based explosives in an industrial coffee grinder as well as other items including a “fully constructed” timer power unit (TPU), a mobile phone controlled detonator switch and a “large amount” of latex gloves. During a failed previous bail application for McConnan, a police officer claimed that forensic examinations of the plastic bag containing the TPU uncovered a finger print attributable to McConnan and that when his main address in Dundalk was searched, police found a quantity of sugar-based material regularly used in home-made bombs. The officer further claimed that the police had evidence that McConnan had used a fake name to buy the sugar-based material, the TPU and a quantity of wire, adding that taking everything together, “we have a fully fledged home-made explosive device”. Following her denials O’Hanlon, now with an address on the Church Road in Forkhill, was released on continuing bail while McConnan was remanded back into custody.